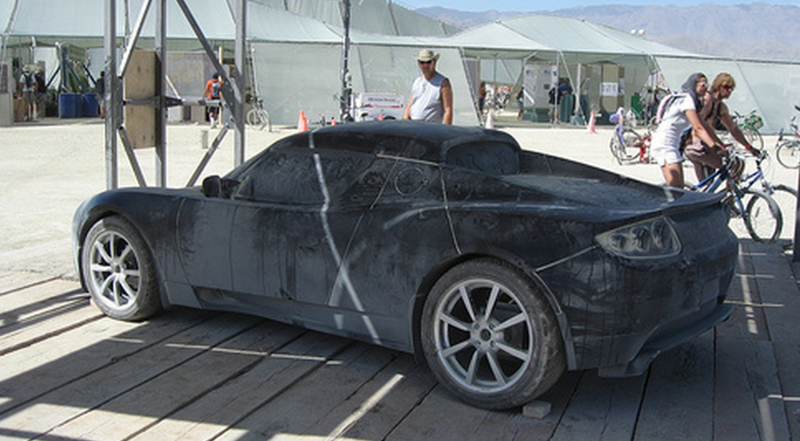 Remember the time Burning Man let Tesla advertise under the Man? Beyond the usual kvetching about Burning Man being “better last year,” or the timeless tale of being taken over by elites, it seems like there is actually a growing fear that Burning Man is, once and for all, being irreparably infiltrated by Silicon Valley. The latest to jump on the pile is person whom I admire a great deal, Breaking Open the Head author Daniel Pinchbeck, who wrote this post about why he is skipping Burning Man. This has particular significance to me as it was his book that cemented my desire to go to Burning Man; this year will be my tenth. The concerns mostly seem to focus on Silicon Valley infiltrating Burning Man and “ruining” it from the outside, but let’s rewind to 2007 when Burning Man almost allowed itself to be “ruined” by Silicon Valley from the inside, until it was ironically saved by an arsonist vandal who later committed suicide. The theme of 2007 was The Green Man, a response to what a decent faction of Burners said was unconscionable consumption and a huge carbon footprint for an event with radical roots. 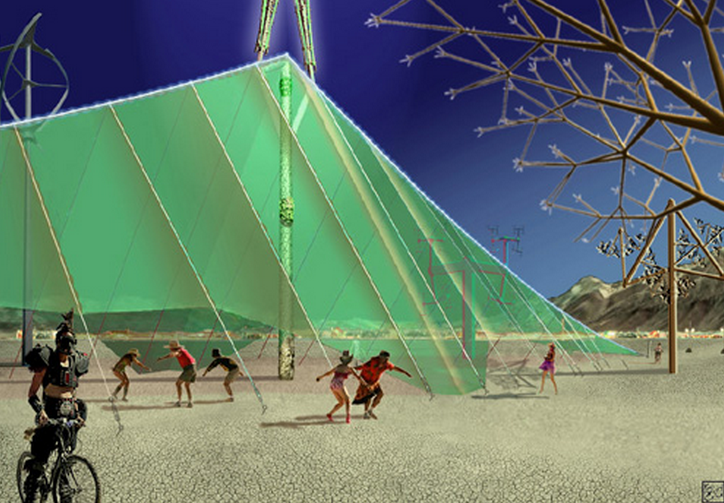 The Burning Man stood atop a structure that resembled green mountain peaks. Nestled at its base was the Green Man Pavilion, 30,000 square feet of shaded exhibition space for the display of interactive artistic, scientific and educational models, a trade show-type display of emerging technologies. This pavilion was surrounded by the Mangrove, made from simulated trees fashioned from recycled industrial materials. Beneath the pavilion were a number of green technologies, some from very large brands; including a prototype of the now-famous Tesla Roadster. Elon Musk is a well-known burner and I can understand why this seemed like a good idea at the time; on the website, the project’s “artist” was listed as Aaron Platshon, a former Tesla product manager. The one condition these brands had to agree to was that they would strip the logos from their products, and simply provide them as “white labeled” objects, much as the closer you are to Center Camp, the less you will see corporate logos on rental vehicles like Budget trucks and U-Hauls. The effect was the creation of a de facto “corporate pavilion” of Burning Man-approved companies allowed to display directly under what is supposed to be the very symbol of decommodification. Even the loosest reading of the Ten Principles makes this decision a head scratcher. Burning Man faced a tremendous amount of criticism that year, both from within the community and without, including a scathing Business 2.0 article that made it sound like Larry Harvey himself had orchestrated Burning Man’s big cashing-out. People screamed on ePlaya, Tribe and elsewhere that Burning Man had finally jumped the shark, sold out, and that they were livid. Sure enough, the man was on fire. Personally I thought this was awesome – it was the chaos that older burners always lamented the loss of, the unpredictability, the makings of a Cacaphony Society prank. Other people were not amused. Was the 2007 Early Burn an inside job? Obviously not, but it had the makings of a good conspiracy theory. Did Larry Harvey want to deflect the criticism of the corporate pavilion? Did he want people to focus on the enemy without instead of the enemy within, like George W. Bush and Osama Bin Laden? Was Paul Addis just a fall guy to preserve the empire? 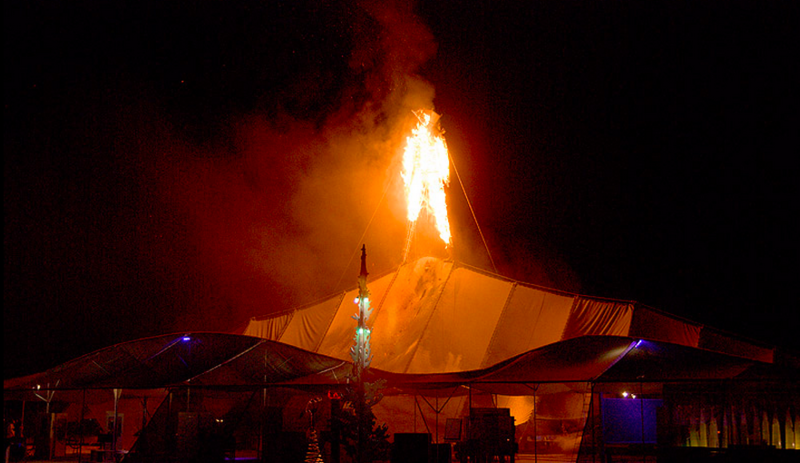 While these are all absurd ideas, one fact is extremely lucky for Burning Man: After the Early Burn, literally nobody ever mentioned the corporate pavilion ever again. The people who actually saw it must number a few hundred at most, many of whom have probably stopped going to Burning Man. So before you start shaking your fist at the cloud and saying, “Damn Silicon Valley bros! Stop infiltrating our event!” don’t forget “your event” once invited Silicon Valley in all by itself, and that nothing is new under the sun.